It's almost time for prom season for many high school and recently I was contacted by Ms Dressy to conduct a giveaway, which gives one of my lucky reader to win a $80 gift voucher.Yesterday, I was contacted by Ms Dressy wanting to collaborate with me and my blog, I am extremely delighted to work with them. As I mentioned early, Ms Dressy wants to take away all your prom/home coming dress shopping stress. So, for all of those who enter good luck. 3. 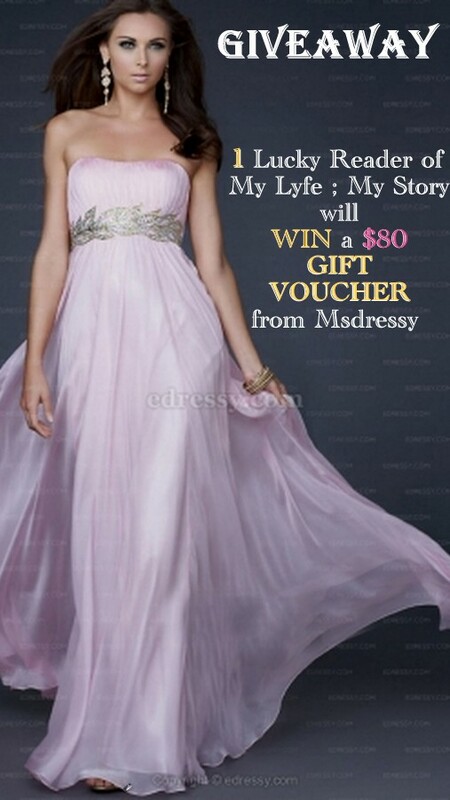 Leave a comment here with the email you registered in Msdressy. This is very important so they can send you the prize!